Groove Dis Exclusive. Debut release on the new BEATS DELIVERY & GLENVIEW RECORDS joint venture. LESCA "WRONG", TARAS 3000 "ROLL THE DICE", KRJUK "GOING ON", LIPELIS pres. TMO "JAM III" + bonus beats. 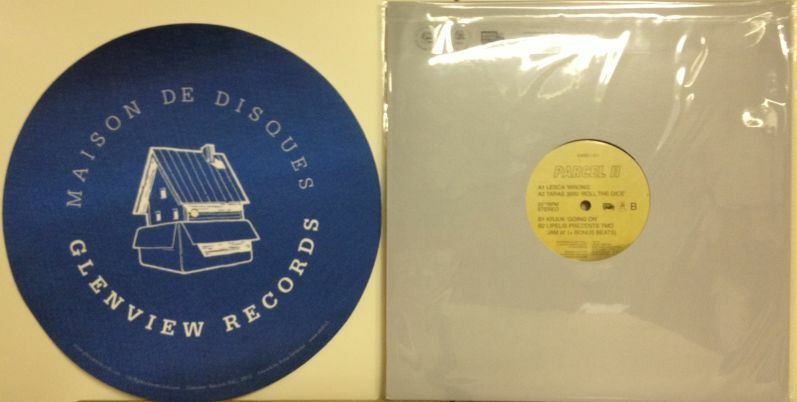 This limited set of 100 comes with a GLENVIEW RECORDS slipmat packaged alongside. Relisted. Last 20 (or so) copies! Beats Delivery/PARCEL II (VARIOUS) 12"
Various/E-FRENCHSOUND.COM VOL. 2 DLP Truth/PUPPETS (TUNNIDGE REMIX) 12" Legendary 1979 Orch/DISCO BUCURESTI 12"
Toy Tonics DJs/TONIC EDITS VOL. 3 12" Gil Tamazyan/VANILLA SIDECAR EP 12" Nebraska/RYE LANE RHYTHMS 12"
Bart Skils/LOST BOYS 12" Various/BANOFFEE PIES: BPLS005 12" Fracture/COLD & RAIN EP 12"